In this interesting but academic book, Susan Strehle argues that a new fiction has developed from the influence of modern physics. She calls this new fiction actualism, and within that framework she offers a critical analysis of major novels by Thomas Pynchon, Robert Coover, William Gaddis, John Barth, Margaret Atwood, and Donald Barthelme. According to Strehle, the actualists diverge markedly from realistic practice, and they do so in order to reflect more accurately what we now understand as real. She says that in the new physical or quantum universe, reality is discontinuous, energetic, relative, statistical, subjectively seen, and uncertainly known — all terms taken from new physics, and that rather than choosing between art and actuality, contemporary novelists pursue both in fiction. Contemporary fiction departs from realism without losing interest in reality. Reality is no longer realistic; it has more energy and mystery, rendering the observer’s position more uncertain and more involved. Changes in physical theories inspire changes in a culture’s general attitudes, and art both responds to and shapes these assumptions. Actualistic fiction and contemporary physics join, I propose, in seeing the external world and the human relation to it as: discontinuous, statistical, energetic, relative, subjective and uncertain. 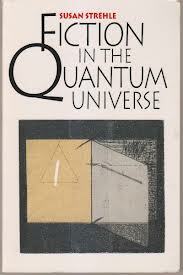 In an opening section of the book, after the explicatory introduction, she explains beautifully and clearly the basics of quantum physics. This section paves the way for the rest of the book which is an in-depth examination of the six authors mentioned above from a perspective of her actualism. It is quite a long book, and if you are interested in the machanics of fiction, and the upper level fiction critiques, you will enjoy this book. Don’t try to ingest it all at once. It needs to be approached in small intervals in order to get the most from it. Actualist fiction is characterized by incompletions, indeterminacy, and “open” endings unsatisfying to the readerly wish for fulfilled promises and completed patterns. Gravity’s Rainbow, for example, ends not with a period but with a dash. Strehle argues that such innovations in narrative reflect on twentieth-century history, politics, science, and discourse.